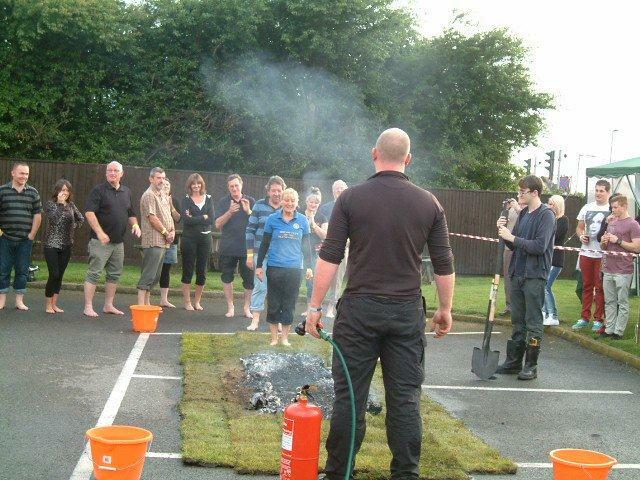 Nobody got cold feet on Saturday evening 14th July when participants were asked if they were ready to walk over hot coals at the Aviator Pub ,Queenborough . The event organised by The Rotary Club of the Isle of Sheppey was watched by a large crowd of supporters. Thirty three people attended an hour’s mind expanding seminar which included a chance to break wood with your hand, break an arrow by leaning on it with your throat and bending iron bars, before being led out to the fire which had been started two hours before and had reached a temperature of 400 degrees C.
First to walk the fire was President of the Rotary Club Louise Henderson who organised the event. The others followed in line and were allowed to have a second go if they were brave enough. The event raised money for several charities. As well as the Rotary Club there were people raising money for The Danny Boy Trust, The Paul Trigwell Memorial Fund, The British Heart Foundation, The MS Society and Cancer Research. Louise would like to thank Phil Chislett at The Aviator for all his help and support and also Shaun O’Meara from O’Meara’s Butchers for the tremendous amount of sponsorship raised. The total for The Rotary Club should be over £1000 after sponsor money is collected. Pictures attached : Louise Henderson first in line to walk the coals followed by a nervous queue.